Before purchasing a Mk2 PV Router in kit form, it may be helpful to see how such a system would behave in the user's environment.Single-phase and three-phase demonstrator units are available for this purpose. 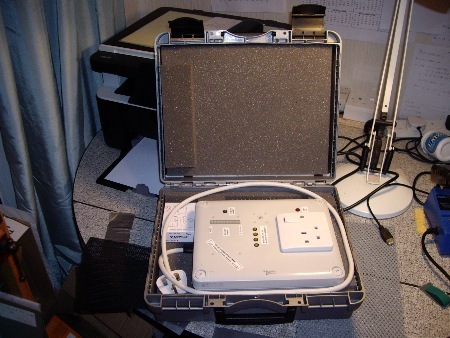 Single-phase demonstration unit in its travel case. The CT is in the white carton under the mains lead. Description of the single-phase demonstration unit. 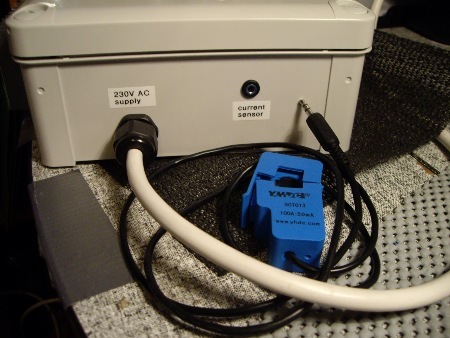 - a "current sensor" (or CT) which clips around either of the 'live' cables by the meter. The "CT" is a YHDC current transformer, type SCT-013-000.It plugs into the jack-socket marked "current sensor". If this plug is difficult to remove, it can be gently freed by using a flat screwdriver.Tugging on the plastic hood can damage the delicate wiring inside. The demonstration unit has a bar-display so that the energy state of the premises can be readily seen. The range of this display is 1 Wh or 3600 Joules. The bar-display provides a real-time indication of how the Mk2 Router is operating. 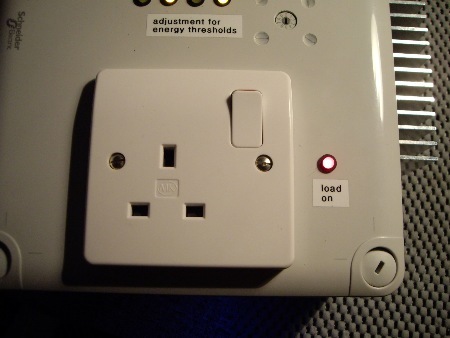 The purpose of the Router is to constrain the energy state of the premises within a range that is not penalised by the meter.It does this by activating a dump-load whenever the energy state exceeds a pre-set threshold.The load is de-activated when the energy falls below a second pre-set threshold.These two thresholds sit symmetrically around the mid-point of the energy range that is covered by the bar-display. By means of a rotary switch which can be turned with a small screwdriver, the upper and lower energy thresholds can be set to any of ten equally spaced values within the 3600 Joule range.At setting 0, the upper and lower thresholds are co-incident so the load is cycled as fast as is possible.This is equivalent to "normal" mode in the software.Values greater than 0 correspond to "anti-flicker" mode whereby an increased energy range is used.At setting 9, approximately 90% of the available range is used so the load is cycled much more slowly. The setting of the rotary switch is indicated by means of four yellow LEDs. These LEDs display the state of the switch as a 4-bit binary value. In this photo, the switch has been set to position 5. The demonstrator unit can also simulate the generation of power.This allows the unit to be used in isolation for demonstration purposes.It also allows the behaviour of the unit to be checked in-situ during periods when insufficient real power is being generated on the premises. 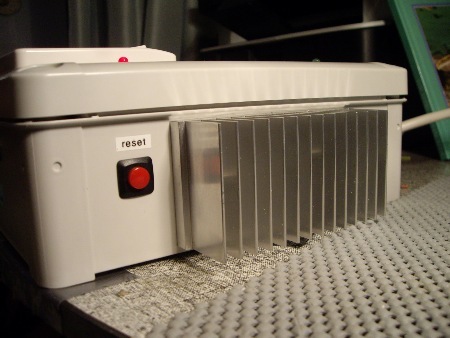 1 kW of simulated power can be activated by means of a switch on the front panel. A prominent blue LED shows when this feature is active. Alongside the bar-display is a single green LED marked "surplus power". This LED is illuminated whenever the energy state is found to have increased during the preceding mains cycle. 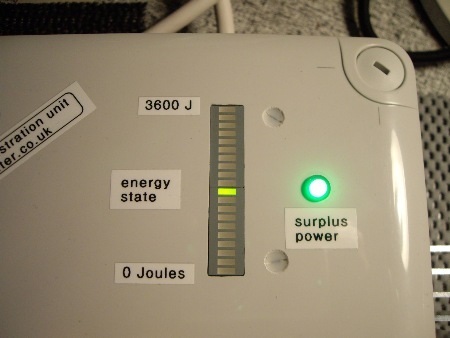 To avoid misleading results, the "surplus power" LED is only illuminated when the energy content of an individual mains cycle is greater than a certain amount (e.g. 0.5 Joules). The "surplus power" LED provides an easy way of checking the orientation of the CT.It should be illuminated when power is being exported, and 'off' while importing.If this behaviour is not seen, the orientation of the CT may need to be reversed. A red LED shows when the 13A outlet socket is active. 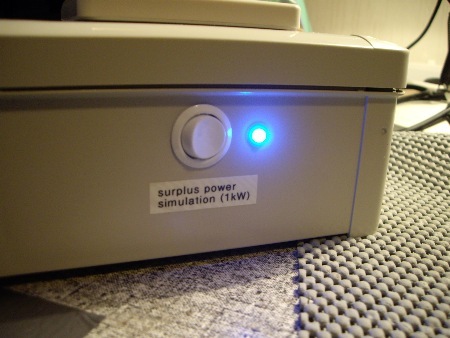 During periods of surplus power, the "load on" (red) and "surplus power" (green) LEDs will usually light up alternately. 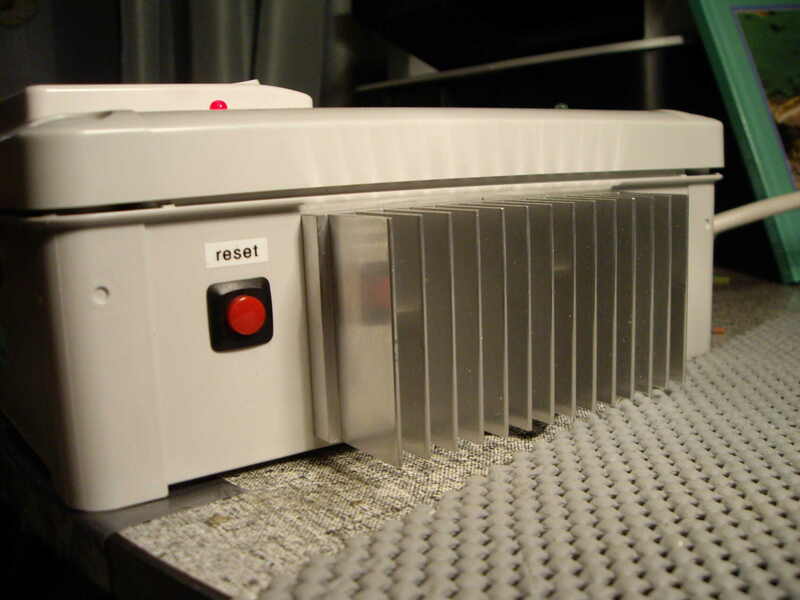 A reset button allows the processor to be restarted without having to turn off the power. The heatsink is needed to dissipate heat from the output stage when operating at high levels of power. 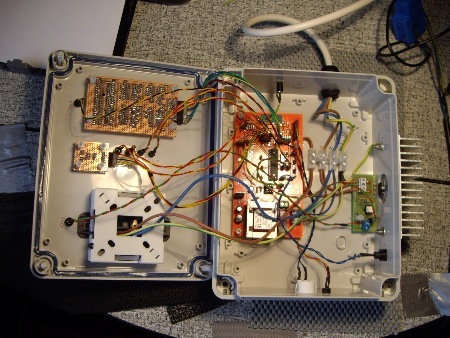 To avoid disturbing the internal wiring, I would be most grateful if the lid is not removed. This is what it looks like inside. The strip-board at the top left is for a pair of 10-way LED bar displays and the discrete logic with which to drive them. Using the single-phase demonstration unit. NB. I took this footage before the demonstration box had been calibrated.At that time, the powerCal value was approximately 10% low which explains why the box was not able to operate reliably on setting 9 with my L&G 5235A supply meter.The box has since been correctly calibrated, and now does work correctly at all settings of the rotary switch.This particular meter has a penalty-free range of 3600 Joules, but not all meters are so tolerant, hence the need for a burst-mode router system to be able to operate within a smaller energy range. 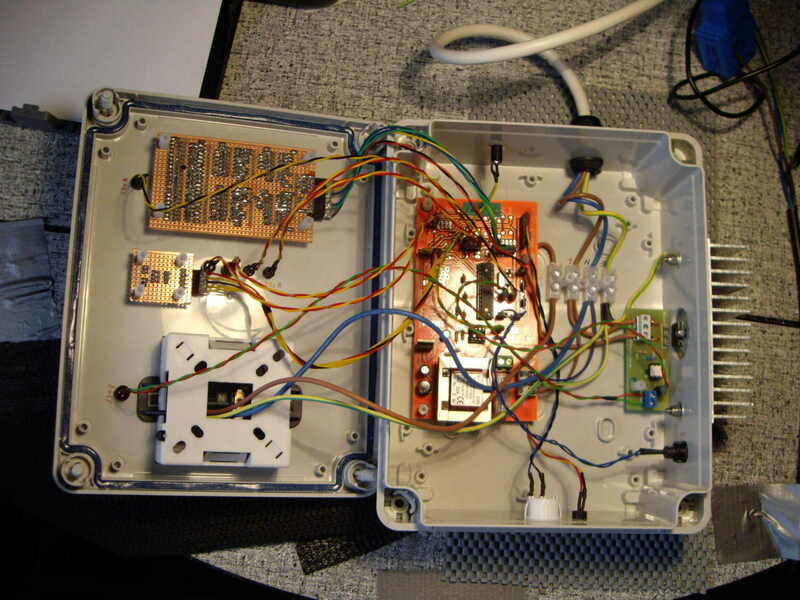 The primary purpose of this unit is to investigate how the supply meter is affected by the activity of the router.This investigation can only be done while some surplus power is available. The first stage of the process is to find out how the meter behaves during continuous periods of import and export.By switching a sizeable load on and off while surplus power is available, the behaviour of the meter whilst in these two states should soon become evident. 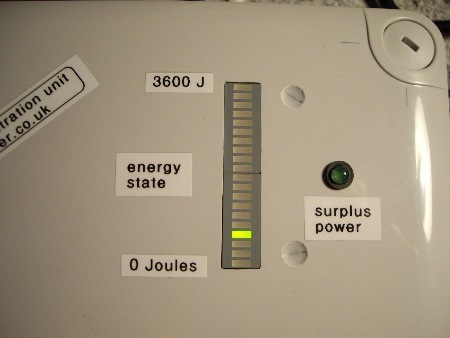 The demonstration unit should start to divert surplus power as soon as it is switched on.With the rotary switch at setting 0, the load will rapidly cycle on and off, and this activity should be ignored by the supply meter.While operating in this state, four LEDs will be flashing.The bar-display will confirm that the energy state is only fluctuating over a small range. 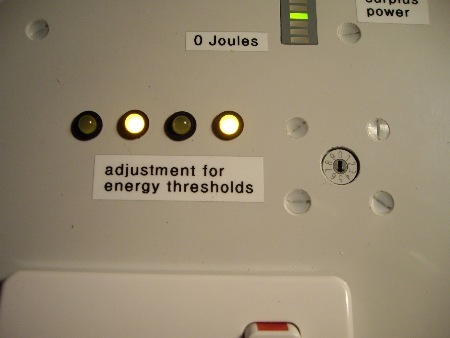 By increasing the setting of the rotary switch, the two energy thresholds will be gradually separated until some consumption-related activity is seen at the meter's LED(s).By varying the setting of the rotary switch while observing the meter, the optimal setting for a Mk2 Router should soon be found. With certain types of meter, it is possible that the operation of the router will not be ignored even when using setting 0.In such cases, it may be possible for surplus power to be diverted using an alternative type of control mechanism. My original 3-phase demo unit shown here was rather large. A smaller version is now available which can be transported more easily. The new version also has the ability to change the threshold levels. 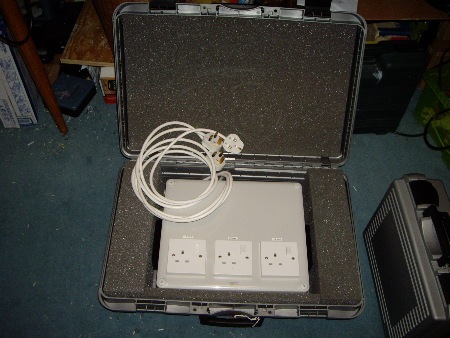 3-phase unit, weight ~6kg:£16.40 + £1.80 = £18.20 each way. I would not expect these demonstration units to be retained for long periods.Once satisfactory operation has been demonstrated, I would expect the item to be returned without undue delay. Each of these units is housed in a lightweight plastic case with internal foam to protect the contents.There will also be an outer cardboard wrapping which should be carefully removed and retained for re-use.